Benedict XVI has issued his second encyclical, Spe salvi, 'In hope we are saved'. 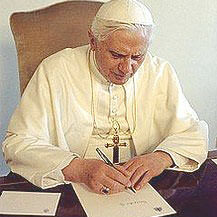 His first encyclical, Deus caritas est, fell neatly into two parts, the first clearly composed by Benedict himself, while the second was based on a draft prepared for John Paul II on the charitable work of the Church. This new encyclical is pure Benedict. We find the renowned Professor Joseph Ratzinger in a virtuoso performance. The encyclical is peppered with references from scripture, Church Fathers, philosophers, saints, and even the scholarly Theological Dictionary of the New Testament. Significantly references to the documents of Vatican II and John Paul II are missing. The first part of Deus caritas est and this encyclical mark a different style from many recent encyclicals. They are genuinely evangelical, exposing basic elements of Christian faith, love and hope, in an engaging, intelligent manner. Benedict is preaching the Gospel to our world. He insists the Christian message is not just 'informative', it is 'performative'. It 'makes things happen'. Benedict begins with an overview of some key biblical texts. The exposition gets a bit bogged down in Greek and Latin translations, but becomes more alive in dealing with the issue of eternal life. Benedict highlights the tension between our desire for life and the realisation that 'to continue living forever appears more a curse than a gift'. Our desires always head for 'more'; every fulfilled desire leaves us dissatisfied. Benedict imagines death as 'the supreme moment of satisfaction, in which the totality embraces us and we embrace totality ... it would be like plunging into the ocean of infinite love'. Significantly he provides such a reading of the work of the great monastic orders who transformed their landscape through manual labour — 'a wild plot of forest land is rendered fertile'. The question is how did this communal dimension of Christian hope get lost from sight? Benedict's response focuses on the way in which 'faith in progress' through science and technology has usurped the place of genuine hope. This is the heart of the encyclical. Benedict analyses the ills of our present context and proposes a Christian alternative. Faith in progress has substituted a 'Kingdom of man' for the true 'Kingdom of God'. This is not a rejection of progress, rather progress can never be a complete solution to our human plight. Progress is ambiguous. It 'offers new possibilities for good, but it also opens up appalling possibilities for evil'. Without attention to the issue of freedom progress can become inhuman. While there can be progress on scientific and technological areas, in the realm of freedom we always start afresh: 'every person and every generation is a new beginning'. Benedict argues that 'the moral wellbeing of the world can never be guaranteed simply through structures alone ... such structures are not only important, but necessary; yet they cannot and must not marginalise human freedom'. Benedict ends his encyclical with three reflections on what he calls 'settings for learning and practising hope': prayer as a school of hope; action and suffering as settings for learning hope; judgment as a setting for learning and practising hope. As with Deus caritas est, this is not the encyclical we expected. A year ago Vatican officials spoke of a new encyclical that would be in the tradition of the great social encyclicals, dealing with issues such as globalisation. We are now told to expect a third encyclical in the near future. Perhaps it is a matter of getting back to basics. Benedict is focusing our attention on central Christian truths. He is drawing us to a deeper level of reflection, building a solid foundation. What he builds upon this foundation we are yet to see. Dr Neil Ormerod, Professor of Theology, is Director of the Institute of Theology, Philosophy and Religious Education at Australian Catholic University, Mount St Mary Campus.